When your RL date returns from the restroom, you say "Welcome Back!" *looking down the list, checking each one* ... Yes, yes, yes, yes, yesyesyesyes ... "Wait! I need more shoes!" Yes yes yes yes to all. Oh my god, I tell people "Welcome back!" all the time now. I get some strange looks, but some just think I'm being really polite. 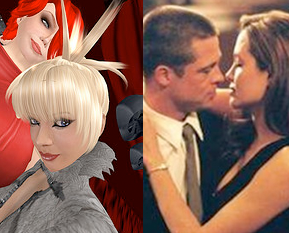 Just found a massive thread in Flickr that started 14 months ago: "You know you've been spending too much time in Second Life when..."